Kathmandu, Dec 1 : Former Prime Minister of Pakistan, Yusuf Raja Gilani, has said hundreds of million people in the Asia Pacific region have been facing terrorism as the major challenge of peace and development. Addressing the Asia Pacific Summit in the capital city today, he said the countries participating in the Summit therefore should place high priority to conflict mitigation. The eastern hemisphere has now become the centre of development and economy, he said, adding that connectivity is imperative for the people in this region. 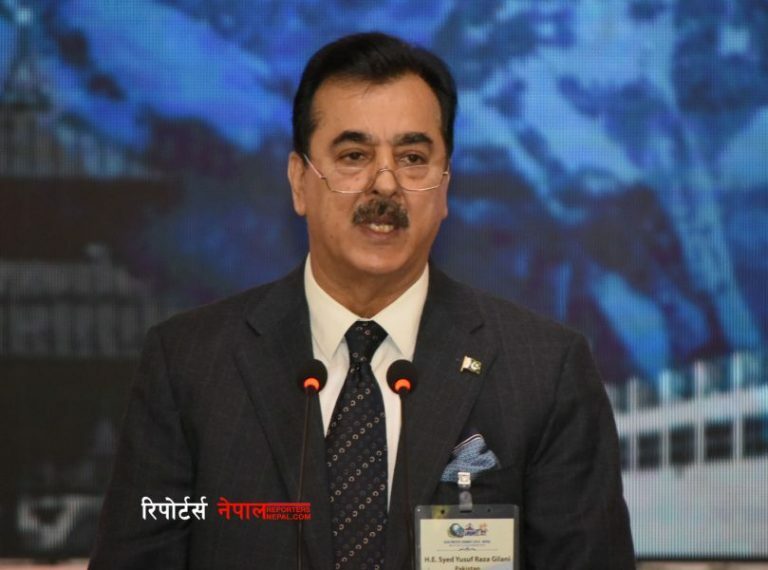 “Pakistan has entered the Belt and Road Initiative, which links ports, economic sector and develops connectivity,” Gilani viewed, arguing that terrorism and fundamentalism are hindrances to the development. Moreover, the former Prime Minister of Pakistan informed that 75,000 Pakistani people have lost lives in the Talibani attacks and 3.5 million refugees are provided shelter in Pakistan. My own son was also abducted by the terrorists, he reminded the terrorism, which he said, a common problem of the people in the region. He admired Nepal’s beauty and Nepalis’ friendliness.